The eldest of three siblings, Tom Degnan grew up outside of Cherry Hill in Southern New Jersey. A self-proclaimed sports fanatic, he was on the track team in high school and briefly considered trying out his athleticism at the collegiate level while attending Notre Dame, but he ended up majoring in finance, instead. "There was a short window— very, very short window — where I thought about actually walking on to the track team for hurdles," he tells Digest. "You realize that all the kids who play varsity sports are bigger, faster, stronger than you so that wasn't going to fly!" It wasn't until Degnan took a theater class (just to fulfill a requirement, no less) that he discovered his passion for the stage. In 2008, Degnan went on to attend Case Western Reserve University, where he received an MFA in Theater. After a couple of small television appearances, including on LIPSTICK JUNGLE, LAW & ORDER and THE USUALS, Degnan was tapped to play mysterious war veteran Riley on ATWT in 2009. Riley was revealed to be Margo's son, Adam, who had been presumed-dead in a bombing in Afghanistan. 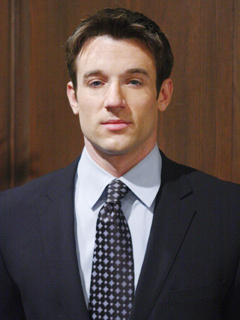 In November 2010, Degnan joined the cast of OLTL in the highly sought after recast role of Joey Buchanan (initially believing he'd lost the part to Josh Kelly, who plays Cutter). Degnan has also appeared on THE GOOD WIFE and is currently in a band with his former ATWT co-star Billy Magnussen (ex-Casey). Is a huge Philadelphia Eagles and Phillies fan. Shares a dressing room with Josh Kelly (Cutter). Drink of choice is a Manhattan. Loves exploring New York City. Enjoys ice skating and golf, but claims to be terrible at both. Congratulations to Tom Degnan (ex-Joey, ONE LIFE TO LIVE et al), who married actress Erin Cummings over the Fourth of July weekend at the Basilica of the Sacred Heart at The University of Notre Dame. The couple was introduced by Christian Campbell (ex-Bobby, ALL MY CHILDREN) and his wife, America Olivo. Tom Degnan (ex-Joey, OLTL; ex-Adam, ATWT) has booked a major recurring role on the new CBS drama LIMITLESS.